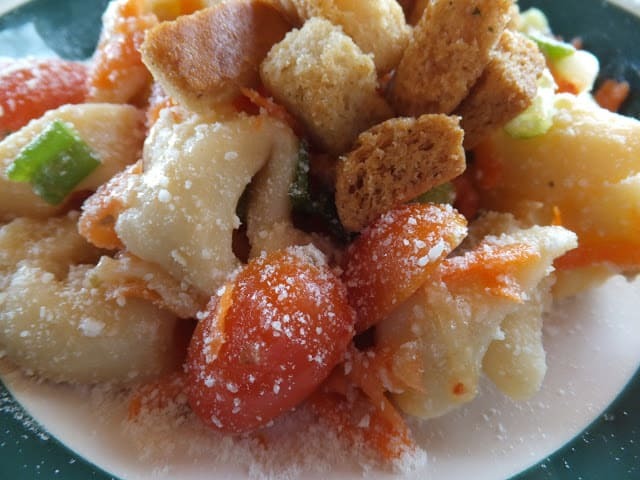 This super simple tortellini salad is always a favorite in my house. This fast, easy and super simple salad can be whipped up in a matter of minutes. Made with convenient ingredients such as refrigerated or frozen cheese filled tortellini and your favorite bottled zesty Italian salad dressing. Grated fresh carrots, cherry tomatoes, green onions and fresh torn basil leaves give this salad a fresh taste. Hard salami and mozzarella cubes add depth to this salad. 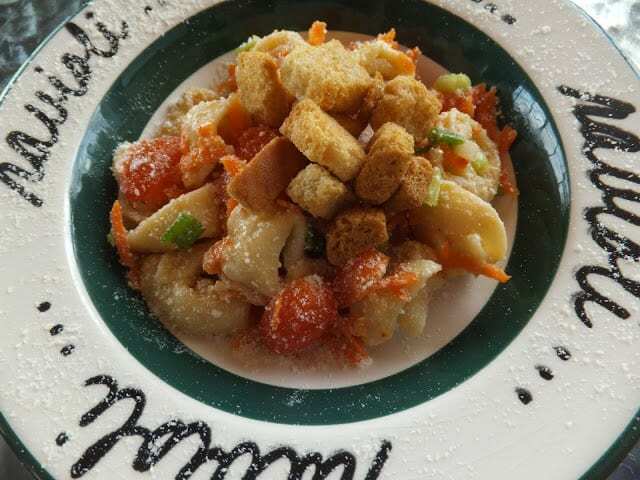 Tortellini pronounced [tohr-tl-EE-nee] “Little Twists” or “Little Hats” similar to cappelletti pasta. Hat shaped, small stuffed pasta. For this recipe we used a cheese-filled tortellini. 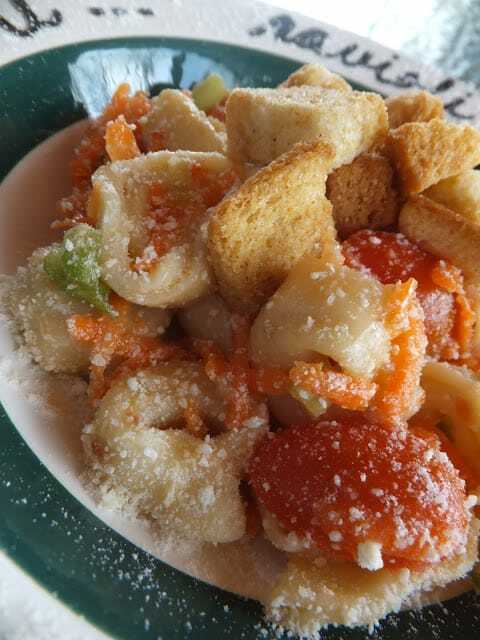 You can use your favorite brand of tortellini or you can certainly make your own, which would take this recipe to new heights. We usually use one of two brands; Barilla or Buitoni. Another option that would really make this recipe ‘pop’ would be to use multi-colored pasta. Crouton Coated, Beer Battered Mushrooms is another recipe where croutons are used to make the recipe special. A flour based beer batter is made and then sliced fresh mushrooms are dipped into the batter. The mushrooms are then dredged into crushed croutons and deep-fried. Talk about good! Crouton coated, beer battered mushrooms would be great served with this salad for a light lunch or dinner. You can use your favorite brand of croutons or follow our recipe below for making homemade croutons. This fast, easy and delicious salad is a cinch to whip up. Making homemade croutons adds an extra layer of delicious. Once you learn how to make croutons, you’ll never ever go back to buying store bought croutons! Homemade croutons are unbelievably easy to make and taste so much better than the dry kind you buy from the store. Easier on your dental work too! Cook tortellini according to package directions. Drain and rinse under cold water. Place in a large serving bowl. Add remaining ingredients and mix well. Make croutons. Preheat oven to 375 degrees. In a large bowl, combine the bread, garlic powder, and salt. Drizzle olive oil over bread while stirring. Stir well until bread is coated by all ingredients and olive oil is absorbed. Spread the bread cubes into an even layer on a sheet pan. Don’t crowd the pan. Bake for 10 minutes, or until golden brown and crisp. If you’re using super fresh bread, they’ll take a little longer to become golden brown. If the bread is stale and dry, it may brown faster, so keep an eye on it! I'm so glad to have found something informative in your site. Thanks for sharing.